Ice Age was the first motion picture by Blue Sky Studios. Released in 2002, Ice Age hit theaters when the boom of CG animated films was still in its early years. Blue Sky looked to make a name for themselves alongside the likes of Pixar and Dreamworks – and although Ice Age can’t go toe-to-toe with the better works of Dreamworks, let alone Pixar – Ice Age did succeed in putting the studio on the map, while simultaneously creating one of the most lucrative animated franchises in the world. Ice Age tells the story of three animal heroes during, you guessed it, an ice age. 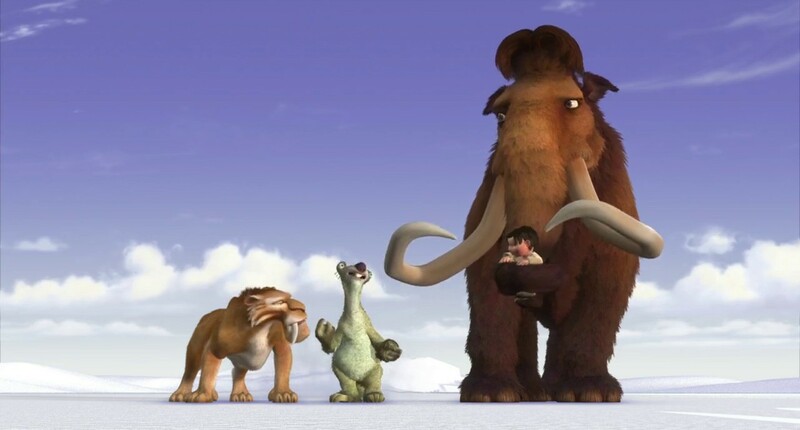 Manny (Ray Romano) is a ill-tempered mammoth, Sid (John Leguizamo) is a sloth who’s bumbling and comedic, and Diego (Denis Leary) is a saber-toothed tiger with ulterior motives. 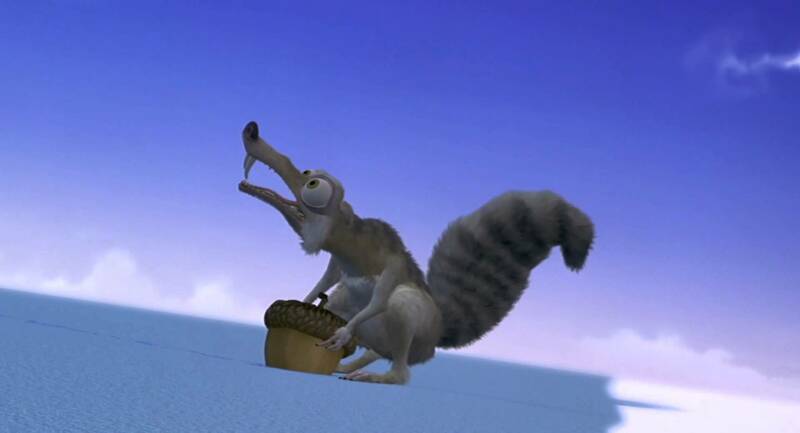 Meanwhile, a sub-plot involving a squirrel named Scrat takes place, providing some slapstick and nonsense as he tries to store an acorn for the ice age. Manny is a bit of a loner, drifting from herd to herd as he simply tries to get by in life. He meets up with Sid, whose persistent quest to become Manny’s best friend annoys the mammoth in a way not unlike the relationship between Shrek and Donkey. During their ventures, Manny and Sid come across a human baby, whose mother saved him from an attack by a pack of saber-toothed tigers. Manny and Sid decide to take the baby back to his home, and meet up with Diego, who becomes the guide of the group. Unknown to Manny and Sid, Diego is from the pack that attacked the humans, and has been tasked with retrieving the baby, planning on leading Manny and Sid to an ambush by his pack. It’s a very simple “buddy movie” plot, mixed in with a little adventure. Even back in 2002 it felt far from original (along with the Shrek/Donkey dynamic of Manny and Sid, the whole “returning a kid to their home” setup felt ripped right out of Monsters, Inc.). But Ice Age does provide some decent entertainment, and even has a little bit of heart to it (something its small army of sequels sorely lack). The animation has admittedly dated a bit. CG animated films have only really captured a fluidity and timeless quality comparable to traditional animation in recent years, so in terms of the technical power behind the visuals, Ice Age can’t hold up. With that said, the character designs are still fun to look at, with Sid and Scrat being particularly memorable for simply being funny from a visual standpoint (the humans are less convincing, however, which might explain why the sequels left them out of the equation). Really, there’s not a whole lot to Ice Age. On the plus side, that also means there’s not much to complain about. It may not be anything special, but there’s also nothing particularly horrible about it. The simple plot and characters work well enough, and make for a fun, if uneventful film. It’s sequels may be struggling to to live up to the original, but the first Ice Age is a charming piece of entertainment. If nothing else. I’ve actually never seen Ice Age, but I kind of want to now, if not to hear Luigi himself, John Leguizamo. The charm of Ice Age and the strong characters put it above most other films of its kind, although it isn’t exactly Toy Story quality. And this one isn’t all nostalgia! Previous Previous post: November is Animation Month!